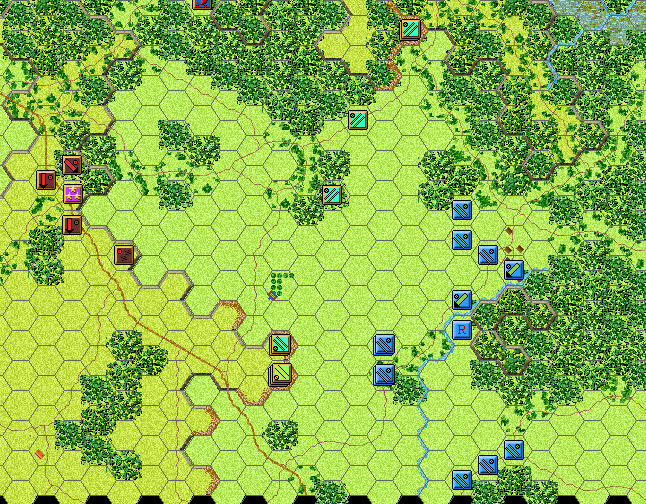 Daniel and I have agreed to play a Peninsula Campaign game. 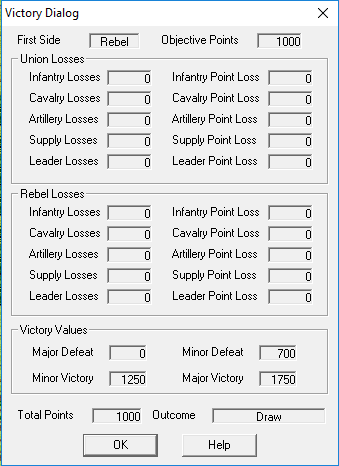 I am going to attempt an AAR on the whole campaign. This is the first battle of the Seven Days; Oak Grove and Old Tavern. 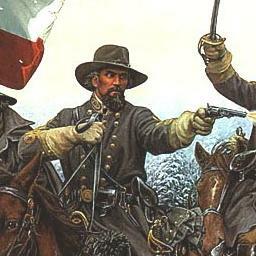 McClellan has done little since the battle of Fair Oaks. This has given Lee, Johnston's replacement after being wounded at Fair Oaks, time to reorganize and prepare an offensive to drive the Union forces away from Richmond. 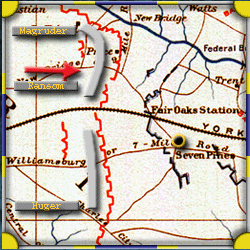 On June 25th the bulk of the Confederate Army is located north of the Chickahominy River. The plan is to crush Porter's lone corps in that area and threaten the union supply line at White House on the Pamunkey River. Jackson's Valley Army also approaches Porter from the north. ...or reinforce the River Bluffs of the Chickahominy. 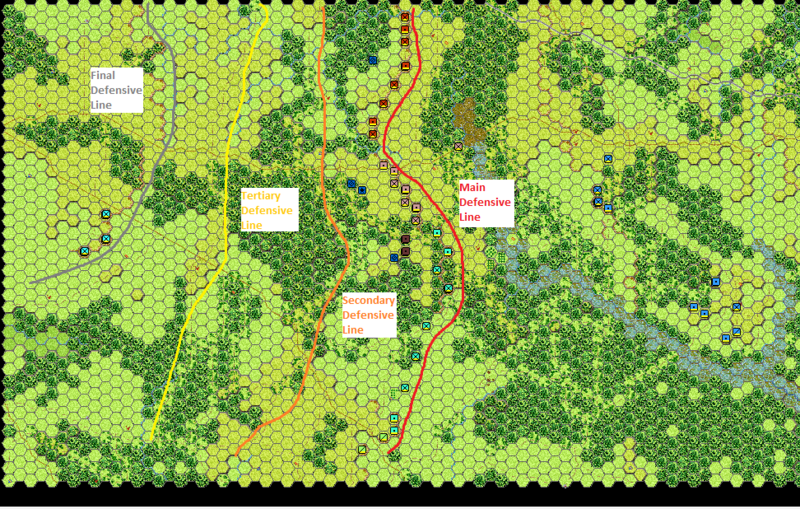 Lee chooses to reinforce the river bluffs, as the swampy ground and forests in the Williamsburg Road area will slow up any Union advance. This also allows Ransom's Brigade to reinforce Huger if needed or support the offensive the following day if the opportunity presents itself. 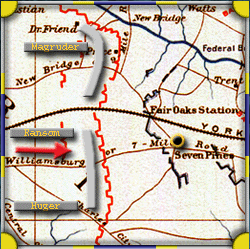 So it seems that Daniel choose to fight the terrain in the Williamsburg Rd area rather then southern guns near the Chickahominy. Here is the battle area. 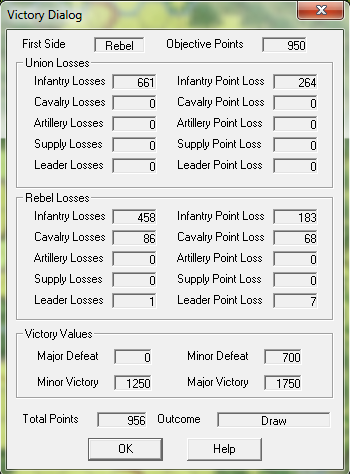 The Victory Dialog shows that I am slightly closer to a Minor Victory then a Minor Defeat. All I should have to do is sit back and shoot the yanks as they approach. The problem is my men are stretched very thin and I don't know exactly where the attack will occur. I have two brigades that may reinforce Huger. They are not due to arrive until 10:00 am at the earliest. That could be a long ways off. If he attacks soon I expect the attack to come down the Williamsburg Rd/Oak Grove area. If I don't see much action for a while it will come from the wooded area to the south of White Oak swamp. Spotted some Union movement during the replay. Looked to be falling back but heard to tell. Lost sight as the turn began. It is getting closer to 10:00 am. So I may have some reserves showing up soon. I think Daniel must be moving to the south. The attack will probably be against Mahone's Brigade. Not that I can do much about it. The line is stretched too thin. I do start to move my reserve artillery down to that area. Here is the overall picture and my planned defensive lines. I don't have much of a plan. Wait for Daniel to attack, plug in reserves as they arrive, fall back as needed. Cause maximum casualties in the process. 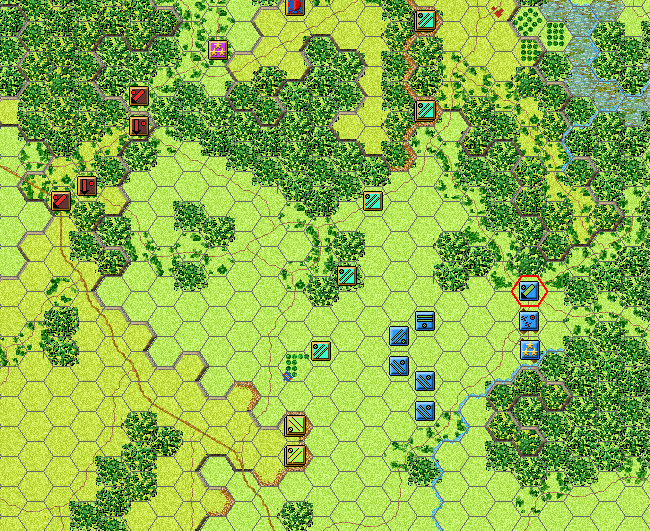 Here are some screen shots of my units, notice I do not have much to hold a broad front and no real reserves. Yanks spotted to Mahone's front. No reinforcements have arrived. This was the first turn they might arrive. I don't NEED them yet, but once they arrive they still have a long march to the front. Daniel seems to be attacking the weakest part of my line, so I expect they will be NEEDED soon. 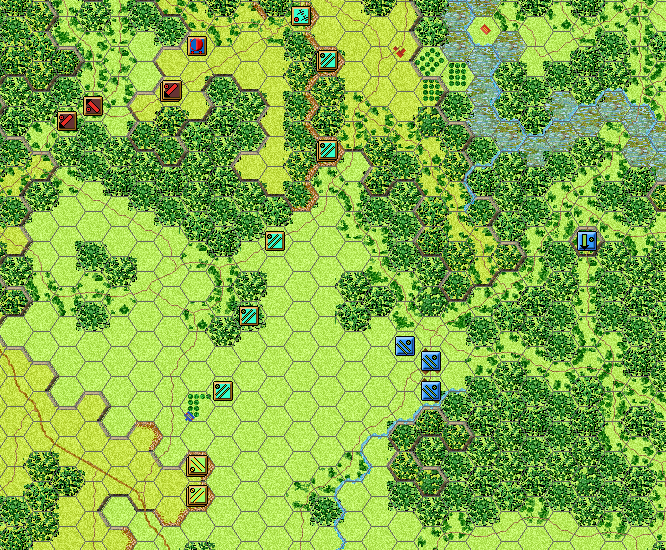 Daniel does have a lot of open ground to cover, and his troops are green (I assume) like mine. I might be able to rout several regiments before he can close on my thin line. Rule Note- Daniel and I play with Rout Limiting OFF. It seems to give a more realistic feel to the battles. 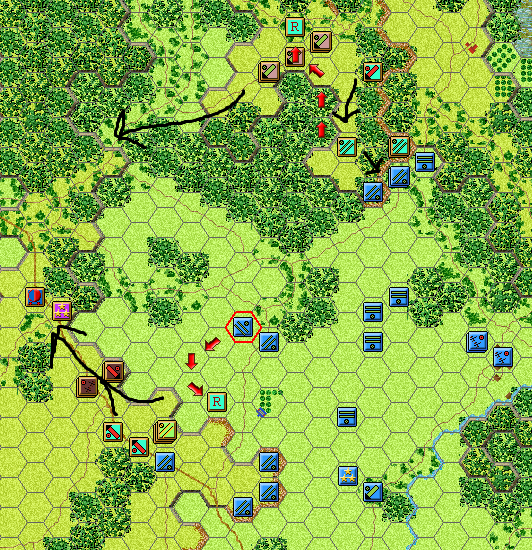 Daniel advances a brigade forward. About half are disrupted from the previous turn. 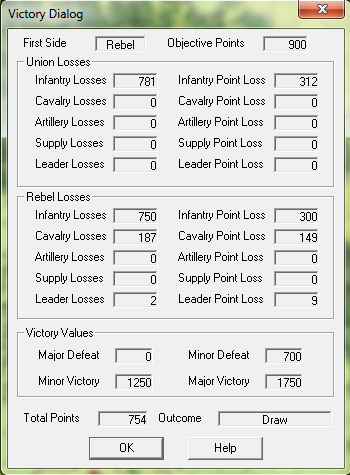 I should point out that there is a section of Guns under each cavalry regiment at the bottom of the screen. 6 guns in total. Also there is a one gun section in the trenches under the second (from the north) regiment of Mahone's Brigade. Due the the elevation it can provide support to the south. And the Victory Dialog at the beginning of my turn. Ransom from Holmes division has arrived in the NW corner of the map. It will be a couple hours until he reaches the front. He brings with him 4,200 North Carolinians and 12 Virginian Guns. This one brigade increases by 50% the number of Southern boys available to repulse the Union attack. More Union forces arrive and advance. Looks like 3 brigades now. 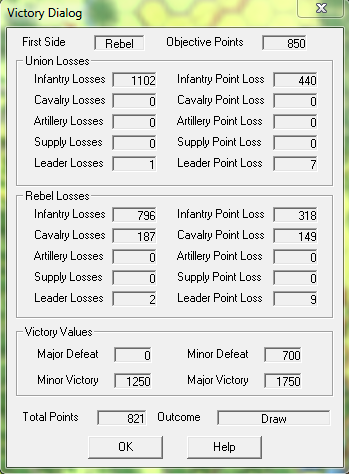 My guns continue to cause casualties and disrupt his units. There is even one routed unit. 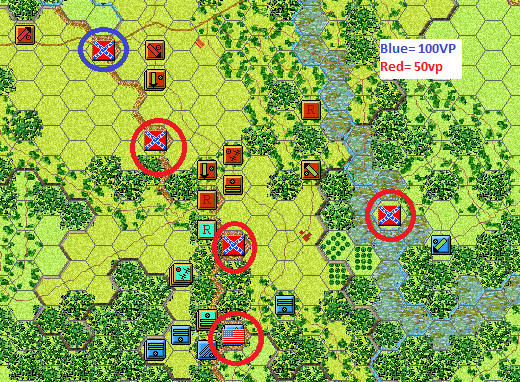 I had moved the 49th Virginia last turn to provide support to the 41st Virginia. 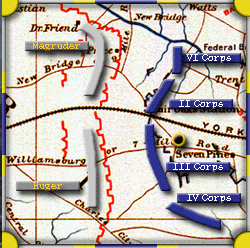 (The map drawing had the 49th VA's original position slightly off). This left a hole that Daniel is now moving against. In addition he tried to overwhelm the 41st and 49th with melee attacks. One worked, routing the 49th. The 41st holds. Victory Dialog from turn beginning. 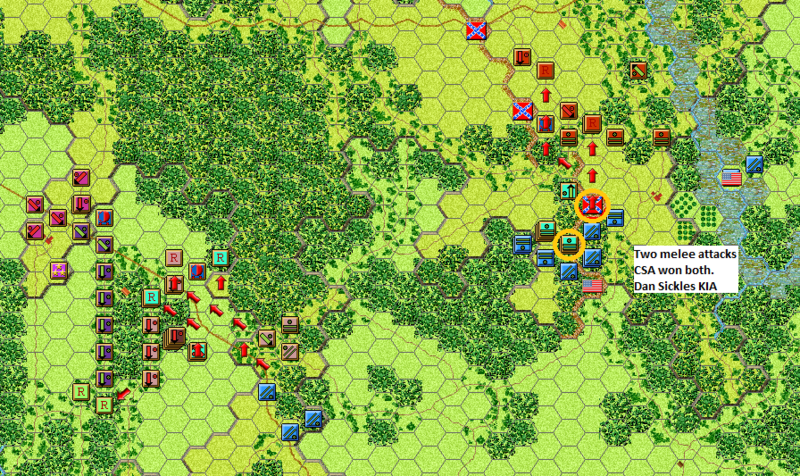 In the meantime I have decided to abandon the first defensive line, sort of. I am hoping Daniel doesn't have any unfixed units to attack it. 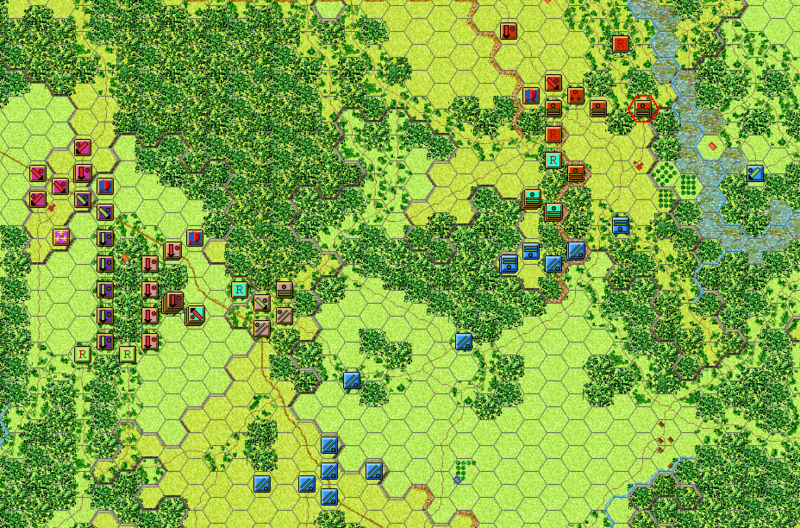 Since McClellan is his commander it is likely that most Union forces will just have to sit tight. If Daniel does have units to attack along the entire line, I will just fall back to my second or third line. It will be slow going for him in the north and center due to the wooded terrain. 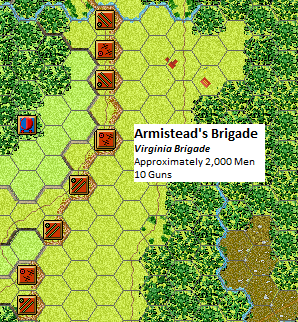 So I am going to bring Wright's Brigade through the woods to defend the south and Armistead's Brigade down to support Mahone's northern troops. Daniel continues to press the attack. He has simply ripped the center out of Mahone's Brigade and is in an aggressive pursuit his right. Two melee attacks launched by Daniel, both successful. The 3rd Virginia Cavalry commander, Thomas Goode was lost as a result of one of the melee attacks. The Plan is still the same. Fall back as fast as possible on the right, preparing for the possibility of skipping the secondary and falling back to the tertiary line. 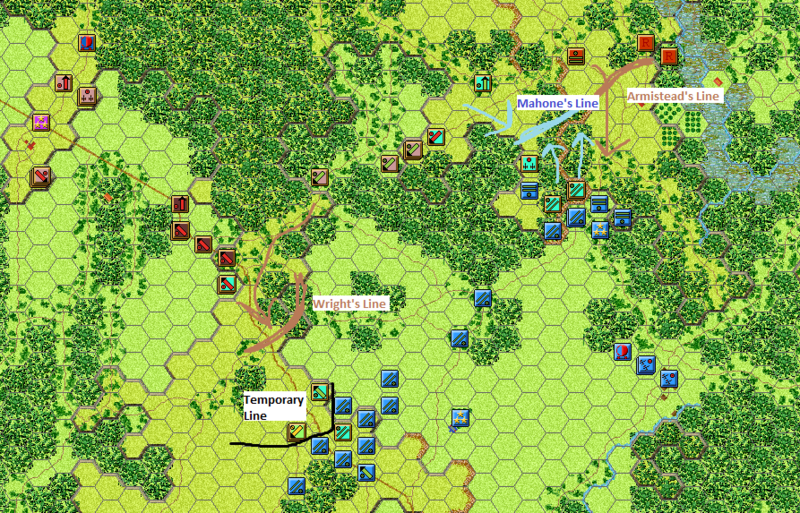 In the center continue to strengthen Mahone's new line which is to face south. 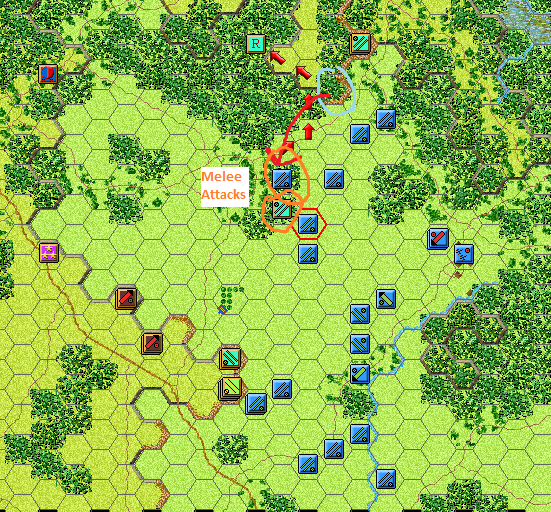 End of turn...Armistead is approaching Mahone's new line on the left and Wright's Brigade will be in position in the south in another turn or two. Daniel hit me really hard on the far right. 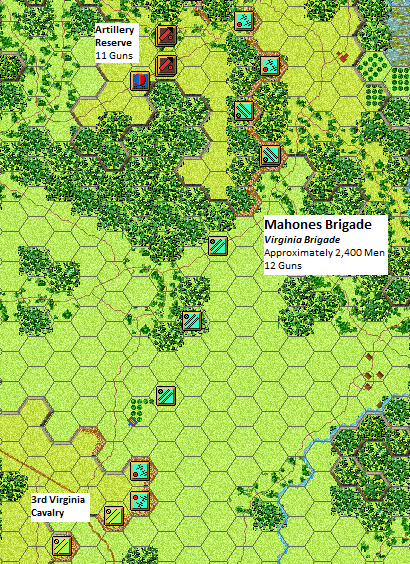 One of Mahone's regiments, the 16 Virginia, is isolated due to a successful melee attack. 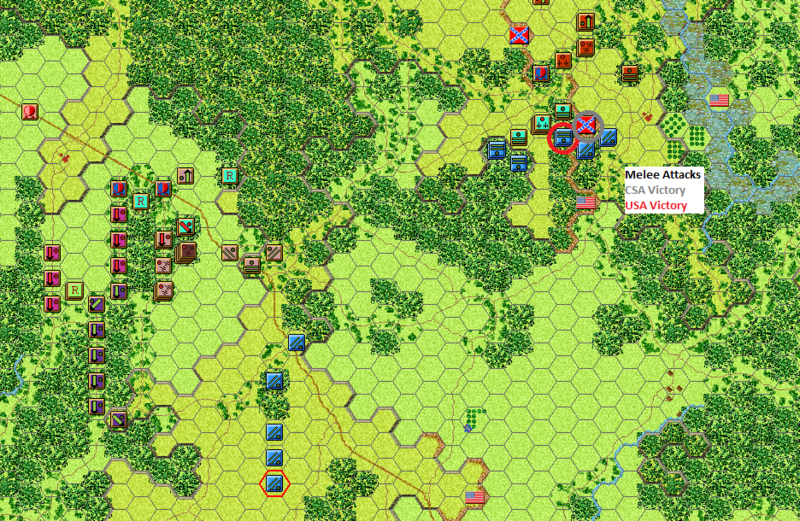 In what was my center but is quickly becoming the left, Mahone holds off one melee attack and disrupts one other. 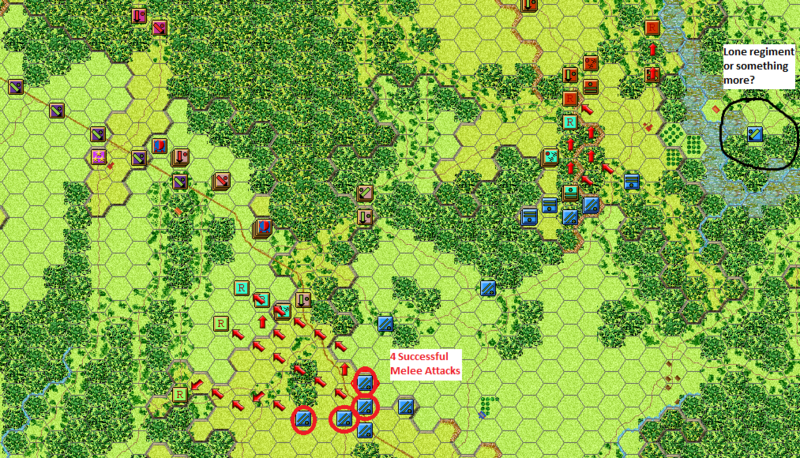 The disrupted melee would have been an attack against unsupported artillery, a sure way for the defender to lose a lot of Victory Points. Armisteads had a couple regiments get hit in the flank by Arty from across the swamp. This caused them to break and run. I'm having to adjust The Plan a bit. Mahone is going to pull back on the left. He, along with Armistead should be able to hold without losing to many VP hexes. 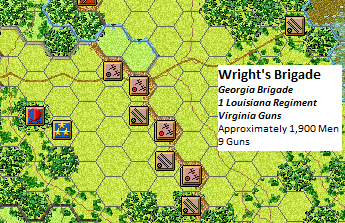 Wright is going to form a temp line to cover the withdrawal of Mahone's lost regiments and the 3rd Va Cav. 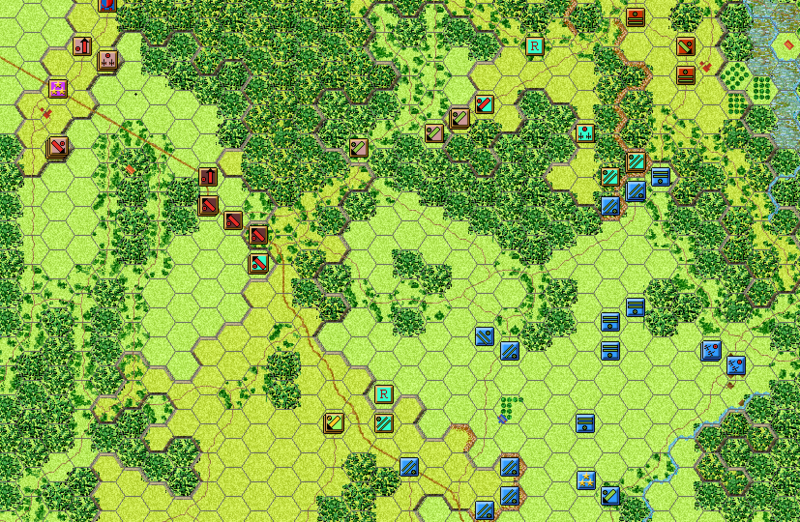 These "lost" regiments will continue to fall back, staying as organized as possible, attempting to avoid being encircled. Not sure if they are going to make it or not. 12 of 23 turns down. I'm halfway there. What a brutal turn though. He crushed my right. In a way it was almost a relief to see the whole right break and run. There would be a lot more still alive if they had routed sooner, but better late then never. 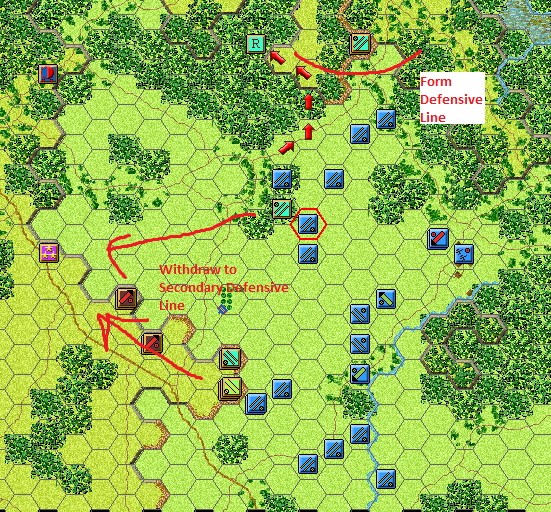 On my left Armistead is gonna find himself on permanent KP duty for the rest of the war if he can't get his brigade to hold steady. Daniel almost has a Minor Victory, he only needs 54 more points. With Daniel being so close to a minor victory I need to really protect each remaining VP hex. Here are the ones at risk. One should easily be captured by Daniel. Another is highly at risk. 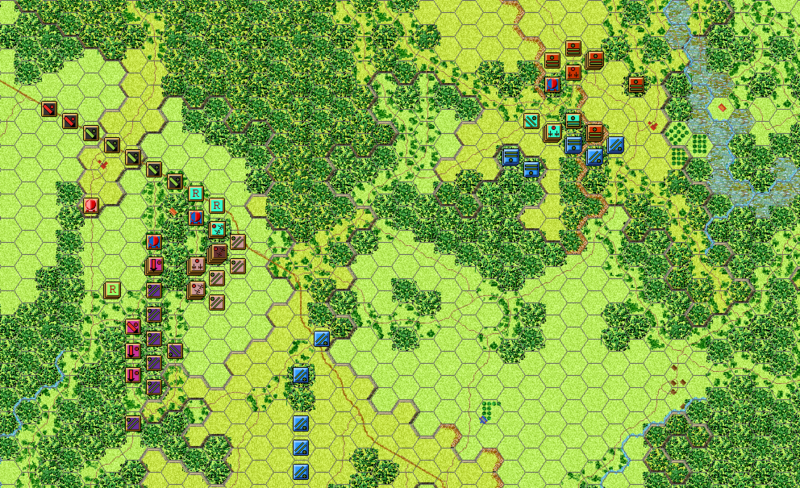 This one hex is what should decide the victor of this scenario. Huger will command the left. He has Armistead's and the bulk of Mahone's Brigade. Probably about 4,000 men. His job is to defend the remaining VP hexes in his AO to the best of his ability. He isn't expected to hold them all, but a loss of 2 more is a failure. This should be Daniel's main and only attack at this point. However I hope it is not. Lee is going to take direct command of the right. He has Wright's Brigade and Ransom's Brigade, along with the bulk of the artillery. He has about 8,000 men. 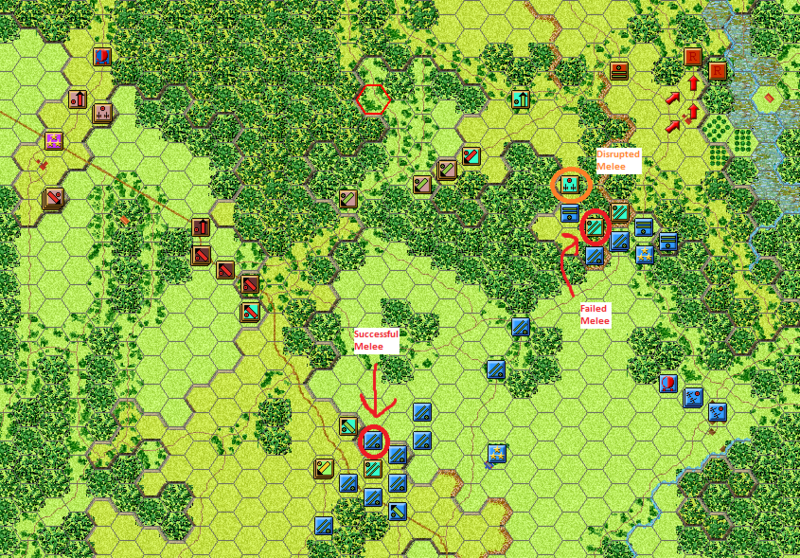 Wright will provide a screen while Ransom and the artillery get in position. 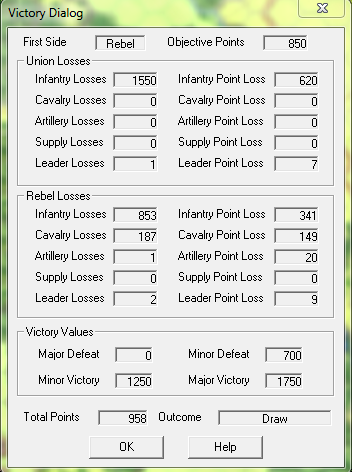 If Daniel attacks he will suffer so many casualties that victory points should shift back in my favor. If Daniel doesn't attack then Lee will launch an attack of his own, taking the pressure of Huger and maybe taking back a victory hex. 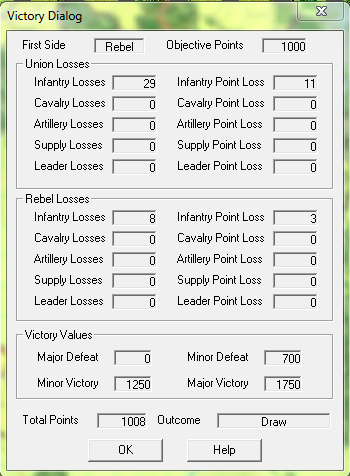 Positions after the CSA Melee Phase. It is hard getting things organized in Huger's AO on the left. I needed a Union turn like that. Daniel launched two melee attacks that turn and both failed. He reported that Dan Sickles was killed in one of the attacks. This last turn very well could be the turning point, even if I did lose one VP hex. 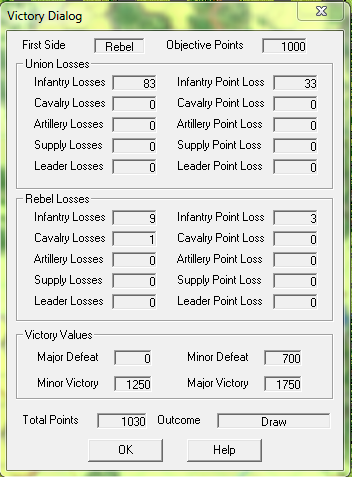 I did have two regiments rout. One belonged to Wright (22nd Ga.) on my right, it shouldn't have routed as it was barely engaged. 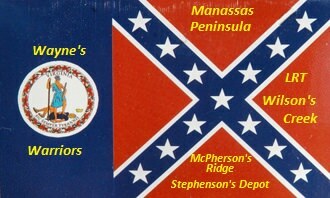 The other regiment belonged to Armistead (14th Va.) on my left. 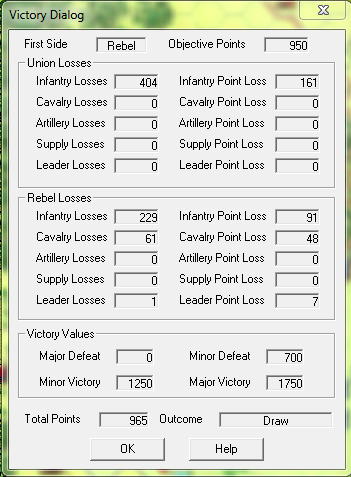 At least the 14th Va survived a melee, I will keep Armistead out of the field kitchen for right now. 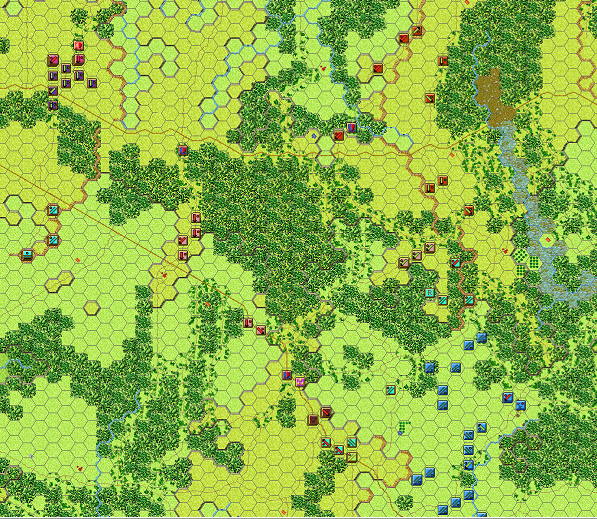 In Huger's AO (my left) I am able to string together a line 4 hexes wide. 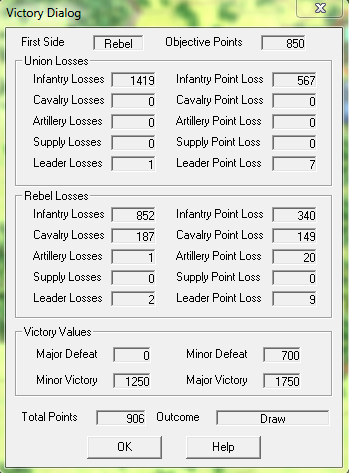 It just might hold as Daniel's units must be fatigued by now, plus I have several guns providing fire support. In Lee's AO (my right) the line is taking shape. I am happy to see that Daniel seems to be pushing forward. He will pay dearly if he continues. He has a brief moment to hurt me here if he attacks my guns in the wood line. Some are not unlimbered and other are facing the wrong direction. But it will cost him more then it is worth or so I think. First there are a lot of guns ready for it. Then Wright will be on the right flank of any attack. 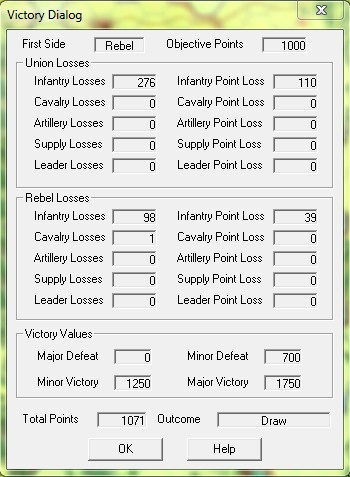 I just wish they had some direct infantry support. Victory Dialog at turns end. 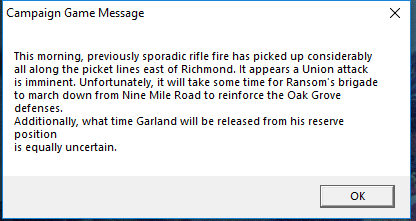 And one last piece of good news, Garland and his North Carolina Brigade (D.H. Hill's Division) have arrived. They will be at the front in about an hour. 2,500 men and 4 Guns. I'm sending them down to join Lee. This will give Lee over 10,000 men to counter attack with when the time comes. No units routed during the Union replay, that is a change. 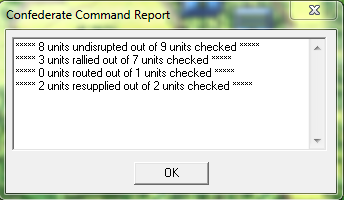 I even had units rally and recover from disruption. He launched two melee attacks. He won one and captured a gun, he lost the other which was for a VP hex. He seems to have stopped his attack on my right, although he might just be organizing his troops for another push. On my far right I was hoping for Ransom to be able to concentrate an attack on the Yank's far left. He seems weak here. 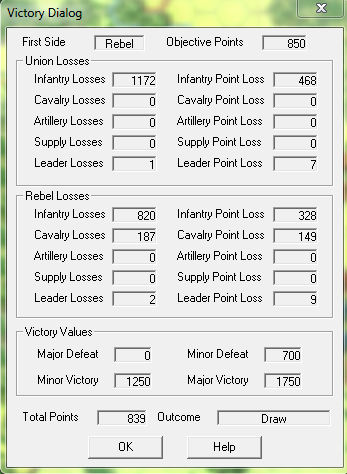 His two leftmost units that I can see have only 500-700 men combined. 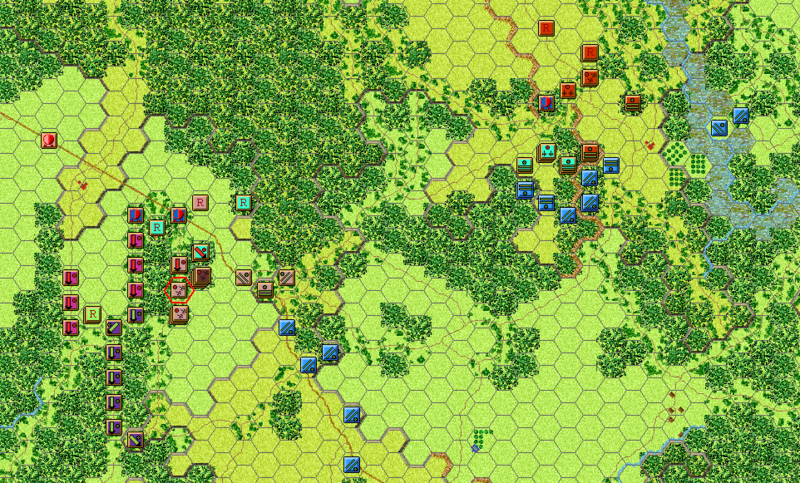 Most regiments in this scenario have over 600 men. I decide to move the spotted unit along the trail. 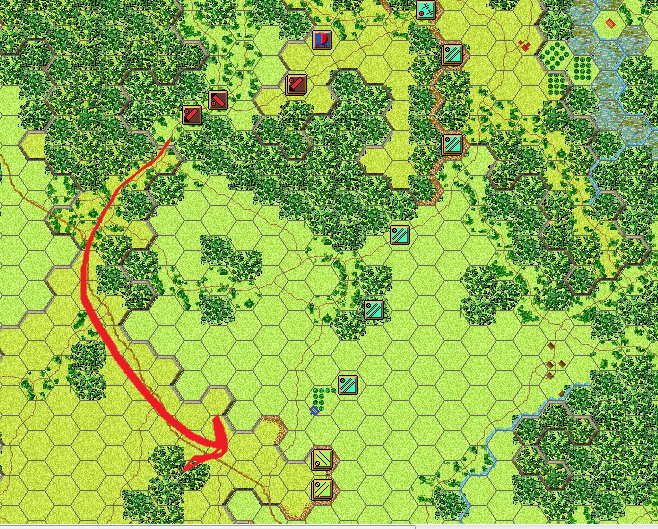 This might cause Daniel to think it is a lone reinforcement or a rallied unit returning to the line. I want Ransom's Brigade to be a surprise. During my movement phase I have Garland arrive at Lee's front. If Daniel doesn't attack next turn then I will. Lee places Wrights Brigade in front of the wood line. This is only temporary, they didn't have enough movement to enter the wooded terrain. 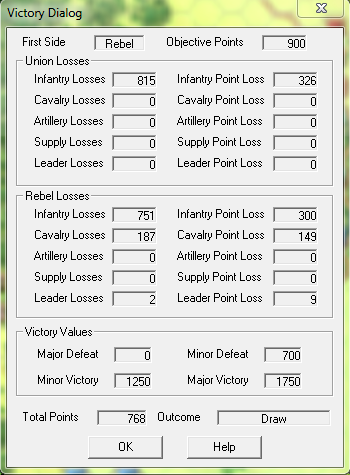 I will lose Arty support this turn if he attacks but next turn arty will devastate him if he does. 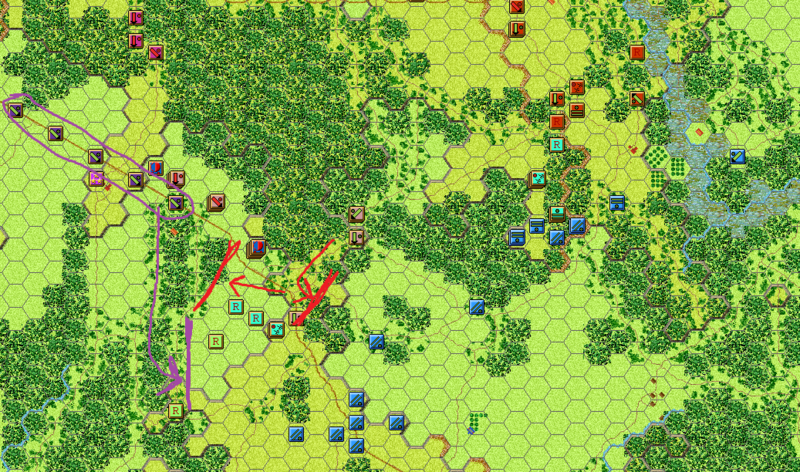 Huger strengthens his second line based on the woods to the north of the contested VP. This VP hex is not so important now. Daniel has paid a heavy price in the lives of his men, more then the VP hex is worth. Still, Huger is going to try and hold it. Arty support from my second line in the woods is deadly on Huger's left. Huger's right is a different story. It is a little more fragile but once again, pushing it back is going to cost Daniel more men then it is worth. Or at least that is what I think, I am more worried here then anywhere.